Case Studies and Testimonials from parents, carers and therapists. SOS helped local boy Harry Newman by generously donating a Sleep Pod so he can sleep comfortably. Harry aged 5, suffers from Battens Disease; a rare and incurable genetic disorder that affects the nervous system. He has several seizures a day and struggles to swallow and stand up. Parents Mica and Tom, and four year old sister Sophie look after Harry full time at their family home in Hilton, Derbyshire. After a few weeks, the finished Sleep Pod was delivered and set up by Ross on a second visit to the family’s home. The Sleep Pod features a Harness to help keep Harry secure during the night and was decorated with a custom made name plaque featuring the number of Harry’s favourite Formula One driver, Lewis Hamilton (number 44). 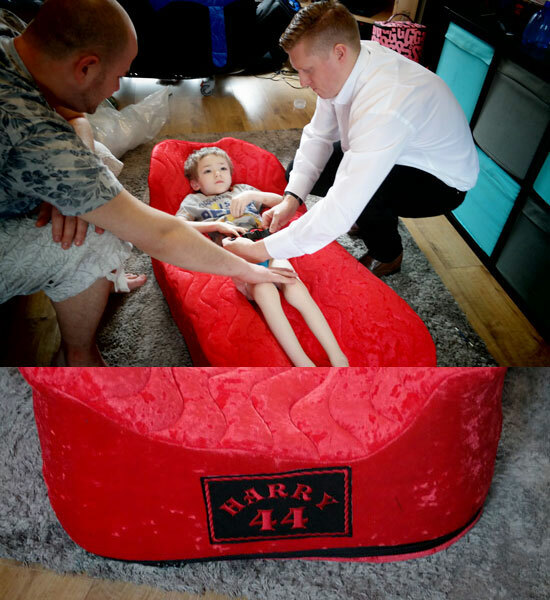 Harry trying out his new Custom Moulded Sleep Pod, Embroidered with his name and Lewis Hamilton’s race number, 44. Harry Newman was in the national papers in April when he got to meet his hero Lewis Hamilton. 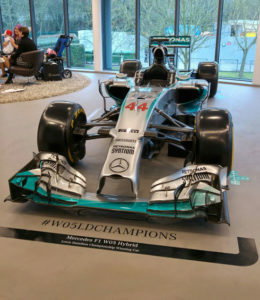 Triple world champion Lewis Hamilton spent 20 minutes cradling and hugging him and stayed longer than he was supposed to so he could see Harry when he was more awake after their drive to meet him in Brackley, Northamptonshire. The meeting with Lewis Hamilton was arranged through British charity Starlight who grant wishes to seriously ill children across the UK. Mica, Harrys mum says: ‘We let him watch the racing when he has a good day, he loves listening to Lewis race and knows exactly what is going on. When it is on TV at home he sometimes says Go-Go-Go’. Now Harry can dream about having his own Maclaren race car whilst he sleeps in his brand new number 44 Sleep Pod. 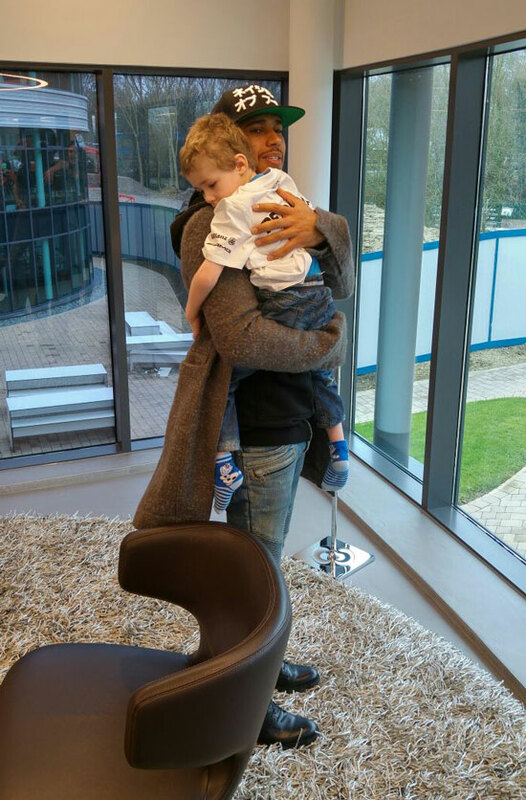 Lewis Hamilton cradling Harry Newman at the race headquarters in Brackley, Northamptonshire. Sam is 16 years old and has cerebal palsy which limits her movement and posture. Sam also has epilepsy and learning difficulties, so her communication is limited. Over the years Sam has had many SOS chairs and at present has a BB seat and Mojo wheelbase. Her Mum, Annette explains: “Sam grows out of her SOS chairs every two years or so. SOS has always been good to Sam and when we found her arm rests weren’t wearing well they sent their head upholsterer Marilyn to our home to see the problem for herself ”. Whilst Marilyn was at Sam’s home Marilyn and Annette got talking about the ‘P’ Pod. Annette explains: “One time I’d brought Sam into SOS and I’d seen a little boy being fitted for a ‘P’ Pod and when Marilyn told me they made them for adults I decided to order one to give Sam another seating option at home. The ‘P’ Pod is the same height as our sofas so Sam really feels part of the family and when she went in it for the first time I’ve never seen her so relaxed! All our family and friends have commented on it. Because she finds it hard to communicate she can get quite cross but when she’s in the ‘P’ Pod she’s like a different young woman. I’m absolutely delighted with the effect it’s had on her. Sam has a standard ‘P’ Pod with growth liner so if she does grow any more she’ll still be able to use it. Tia is 11. 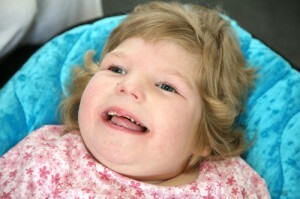 She has a chromosome abnormality which means she was born with Lissencephaly – smooth brain. It’s an extremely rare condition which it is estimated affects between 10 to 40 per million babies. In Tia’s case, it has affected both her mental and physical development. For Tia Lissenchepaly means that she has no speech and the mental age of a six to nine month old baby. In addition her condition means that her physical development has been profoundly delayed and she has poor muscle development. She is unable to sit unaided. “Tia has very poor trunk control and she has a dislocated hip which means that she needs seating that both helps correct her hip as well as give full body support. 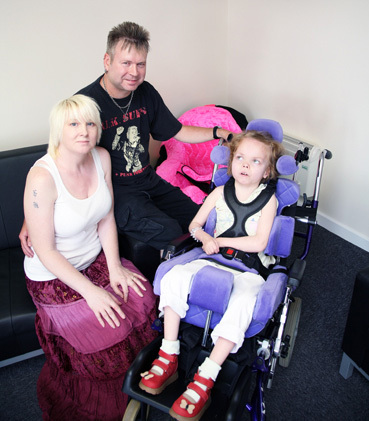 “She has a Mojo seating base and a BB seat, both from SOS, and despite being on medication which restricts her weight-gain she’s now in her third chair in five years. The BB seat is a modular seating system which can be adapted to Tia’s needs. 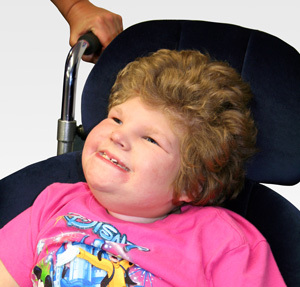 “Tia’s seat has several components to help her – a head rest which helps keep her head in an upright position and helps her see what’s going on around her. Her harness helps support her trunk and stop her falling forward and a hip belt and pommel both help keep her dislocated hip in the right position. We believe this seat has really helped her physical development. When the physiotherapist examined her she couldn’t believe how straight her spine was. She was expecting it to be curved. Ankle supports and foot rests also help keep her grounded as she can feel her feet are supported. “We believe her seating has also helped with her digestion. Tia suffered with digestive problems and was diagnosed with dysphagia. She was inhaling her food into her lungs and getting weekly chest infections for which she was being hospitalised. This was a real worry and the doctors suggested a peg so food could go straight into her stomach, but we wanted to explore other options as once the procedure has been undertaken it’s irreversible. Once Tia was fitted with her BB seat the problems stopped. She’s not had a chest infection since thank goodness. “She also has a ‘P’ Pod from SOS which we decided to buy privately. It’s a great piece of kit as it looks like a beanbag and gives her another seating option – she can view the world from a different angle. We chose the standard seat, as opposed to the moulded one, so she can grow into it. It’s a great addition for us too because it’s unobtrusive in the home and it’s so easy to transport and move around. She goes in the garden in it and is really happy, and because it’s lightweight and easy to assemble and take apart we can just throw it into the car and take it on holiday with us. “Tia was one of the first children to have a ‘P’ Pod and we came across it at the Naidex exhibition. We’d taken Tia there to have a look and see what new equipment was being developed and saw the ‘P’ Pod on SOS’ stand. Well we had to let Tia have a go in it and as soon as she was seated she was really happy, clapping away. Then sat back and put her hands behind her head, something she rarely does. She looked really chilled and relaxed. She even drew a crowd of passers-by who couldn’t quite believe what they were seeing. Tia goes to the Woodlands School in Coleshill and the family live with Tia’s 19 year old sister, Elizabeth in Atherstone, Warwickshire. Lucy is six years old and has Agenesis of the Corpus Callosum (ACC) a rare birth defect which means the middle part of her brain is absent. Lucy’s condition means she has no sight, low muscle tone, poor motor coordination and chewing and swallowing difficulties so she has a gastronomy tube for feeding. Her posture hasn’t developed properly so she can’t sit up by herself so her condition means having the right equipment is essential for her health and wellbeing. Her Mum, Jane, explains: “Lucy was diagnosed with her condition at five days old. When she was a little baby she had a traditional baby pushchair but it had no padding so we knew that Lucy would need specialist equipment that would benefit her needs and development so she was both comfortable and happy. “Lucy was one of the first to have a ‘P’ Pod from SOS and it’s fantastic for her. Because it’s moulded her torso gets the support it needs. The beanbag design makes it easy for us to put her in a reclining position as she can get quite chesty so sometimes she benefits from being in different positions. “It’s great for us as a family as well it’s so easy to use and move around. We can take her in the garden, which she really enjoys, and when we’re visiting friends and relatives because it’s essentially a beanbag it means it’s easy to put in the car. It makes it much easier not having lots of bulky equipment. We also loved the fact we could personalise it so we chose to have Lucy’s name embroidered on the front. “Lucy’s been going to Saxon Hill Special School in Lichfield for two years so we knew we’d need to get equipment that benefits her in a school environment. We needed a seat which allowed her to both sit up and lie back. She also has dislocated hips so we couldn’t opt for a traditional stander so she had a customised Straddle Seat made by SOS which allows her to be in a better functional position and keeps her in an extended position reducing the stress and discomfort through her hips. This has helped her to join in classroom group activities with her class mates and work on developing more functional activities. “The Custom Straddle Seat is attached onto a Glider Mobile Base which has a rise and fall action to allow her to access things at different heights and also a tilt function so her teachers can recline her should they need to. We also use it at home when we’re dining as a family. It means she can join us at the dinner table using the rise function to achieve the required height so she always feels included in whatever we’re doing.